The reservoir formed by Hauser Dam is 15.5 miles in length and only 0.1 miles to 1.1 miles in width. Hauser Lake has a mean depth of 26 feet and a maximum depth of 70 feet. The creation of Hauser Lake led to the creation of nearby Lake Helena. The water impounded by Hauser Dam inundated the lower portion of Prickly Pear Creek, causing the formation of Lake Helena. A narrow canyon 3.9 miles in length filled with deep water (known as the Causeway Arm) connects Hauser Lake with Lake Helena. This lake offers some of the best trout fishing in the country. Large brown trout can be found here pushing ten pounds. 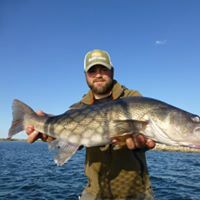 There is a great spring walleye bite on these two lakes. This trip is based out of Helena, MT.